With the realisation of my website, I have decided to try a new approach with these instruments and offer my customers the opportunity to buy any them at a fair price on a 'sold as seen' basis. Most of the instruments on this extra list should have a complete overhaul done to the reeds but I have had many enquiries for cheap accordions so that someone would get an idea of playing without having to spend very much. 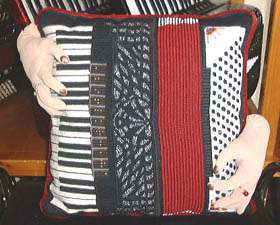 The average cost of the accordions on this list will be from �0 - �0 depending on the specification and general playing condition and I will endeavour to fix the price individually as time allows. A full overhaul will cost around �0 on a full size accordion so once repaired they would sell from � Some of the accordions may not be as cosmetically pleasing as I would want, but in my experience I have spoken to many customers who are not concerned about the looks; or in some instances, some enthusiasts may be 'handymen' willing to have a go themselves at certain repairs as long as the instrument is generally playable in the first place. The picture above is of a cushion expertly designed and embroidered by Zena Tibbenham. *(R.T.B) (unless stated otherwise as with the special deals section). This list was last reviewed March, 2019.